Streets Ahead Style: How to tame crusty cuticles. How to tame crusty cuticles. Whoa how embarrassing is that picture? LOL I can't even!! Not only do my cuticles look better now but my polish application has much improved. Jeez, what was I doing? You can use this cuticle softener from Sally Beauty or the CND cuticle remover, I find both work equally well to remove cuticles. 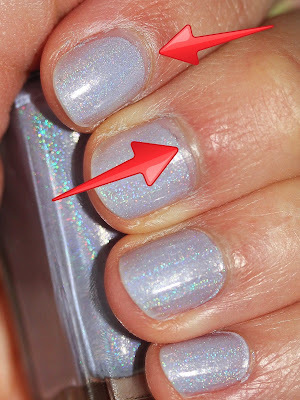 First, you dab a little of the product at the base of each nail then you'll smooth it out along your cuticles. Don't rub it in but try to build it up around the cuticle. Leave it on your nails for anywhere from 3-5 mins. After the time is up take a cuticle-pusher-backer-thingy and, using circular motions, move along the base of the nail. You should be able to see your cuticle being removed. If you're using the Sally Beauty cuticle remover you'll want to wipe the residual product off with a clean paper towel but if you go with CND just rub in the leftover product. To make sure them cuticles are super healthy, apply cuticle oil or our personal favourite: Burt's Bees Lemon Butter Cuticle Cream.